…maybe this is going a bit too far. But like I always, I’ll start from the beginning of my notes. — It’s the same ol’ story: bad things happen, but nobody ever remembers anything. 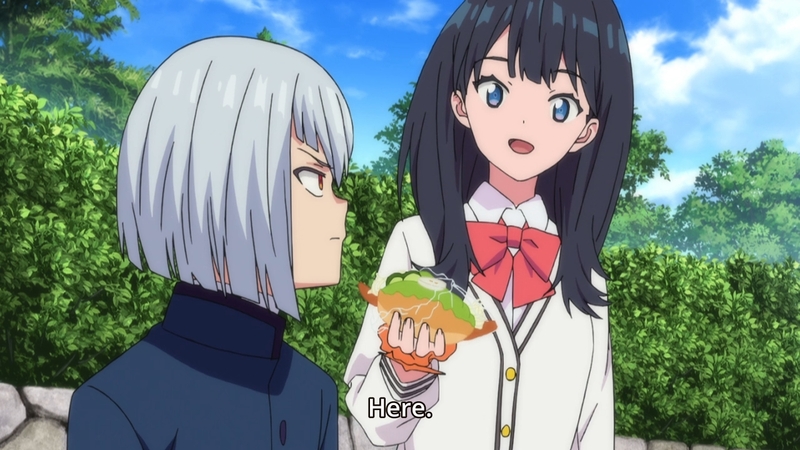 The Gridman Alliance continues to truck along without a care in the world. Well, maybe they should start caring, because the series is pretty much at the halfway point. It’s all fun and games with mechas, kaiju, thighs, but the good guys eventually have to start figuring out how to stop these attacks for good… right? — Basically, I just wish our hero was more inquisitive. I wish he was more proactive. 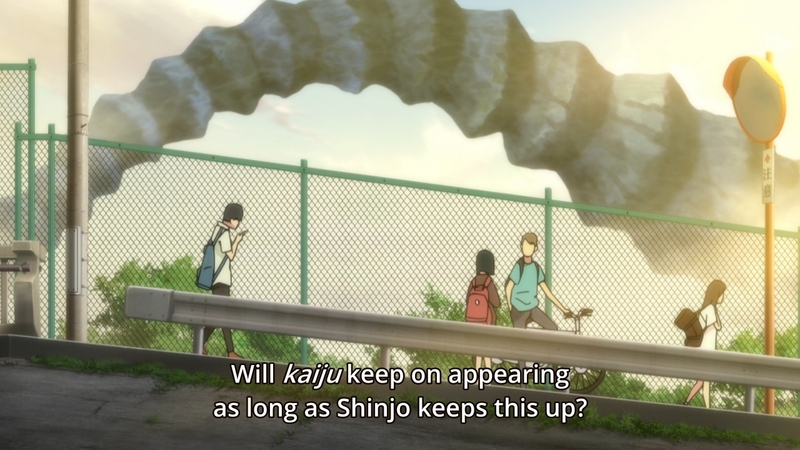 I wish he would try to solve this mystery instead of just waiting for a kaiju to strike. — Speaking of thighs, Rikka’s legs have suddenly become all the rage. 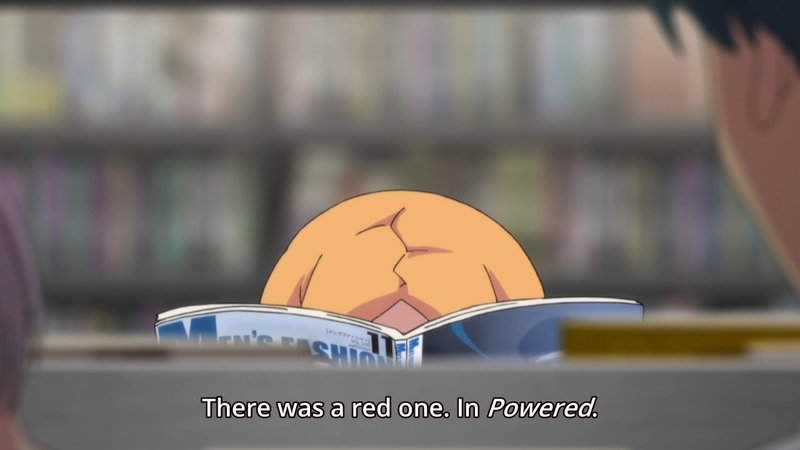 They’re ordinary anime legs, but because her oversized sweater makes it look like she’s wearing nothing underneath, the viewers go crazy. Perception is a helluva drug. — Right before she heads home, Rikka catches Yuta staring at her, and this awkward moment between them just kinda lingers. Kids, man. I also wish Yuta was a little more courageous when it comes to the matters of the heart. Add that to the list, I suppose. I’m not necessarily rooting for the guy, because I don’t really need to. After alll, it already feels like a foregone conclusion. You can thank the OP for that. I just wish these two would get it over with. — Elsewhere, Anti continues to wait outside Akane’s house like a lost puppy. Was it ever confirmed that she created him? — Anti wants to kill Gridman so badly, so Akane sics him on Yuta. The girl doesn’t hesitate. Gotta give her credit for that. Unfortunately, Anti refuses to follow this order, because his only enemy is Gridman. So why did he even bother to ask? 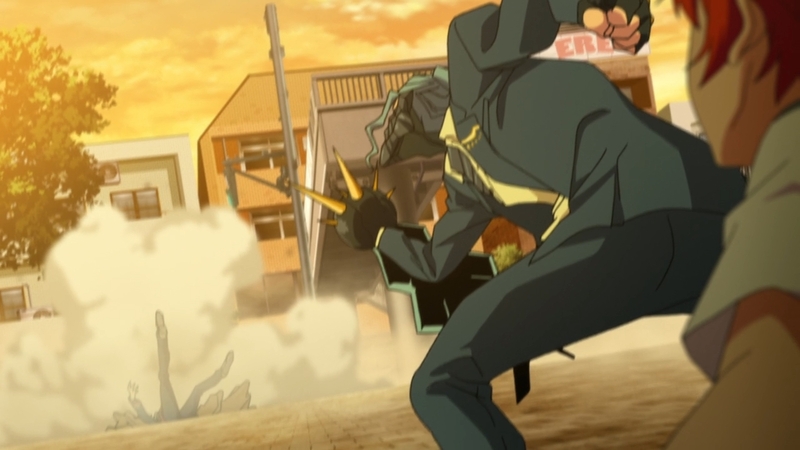 — And with his marching orders, Anti heads off to fulfill his mission. 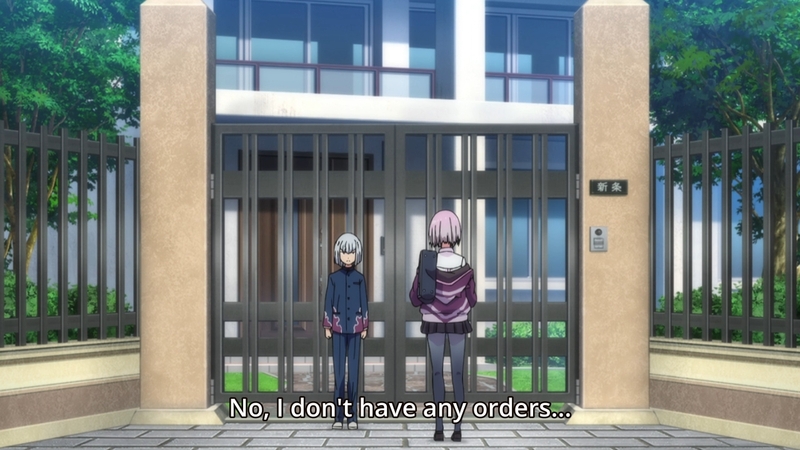 Akane didn’t even have to give the kid a very persuasive argument. 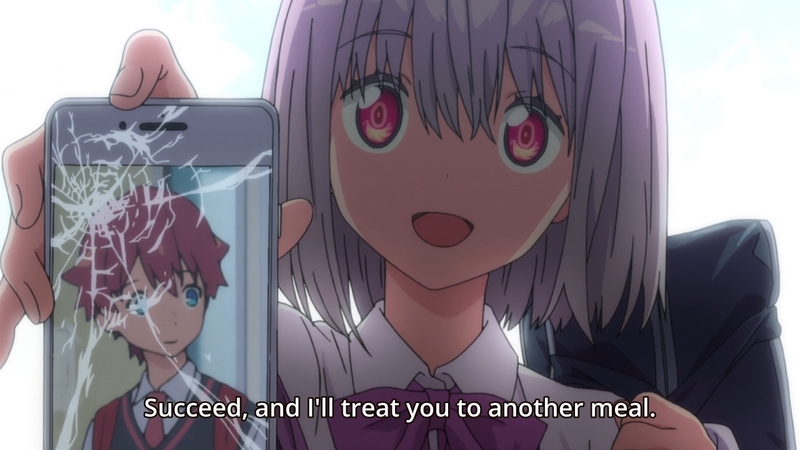 After all, she doesn’t really have any proof that Yuta and Gridman are one and the same (they’re kinda not, I guess?). — Oh hey, the computer is back at the junk shop. — Bored with herself, Rikka eventually goes on a walk around town. 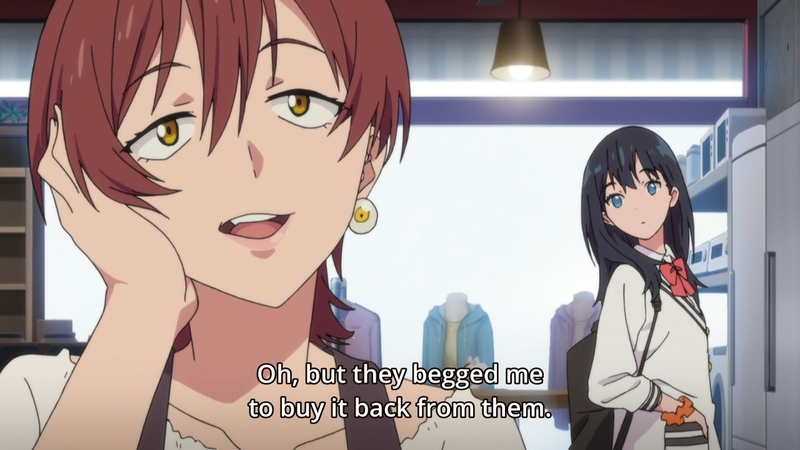 It looks like she wants to buy Akane a wallet? Kinda odd. I guess she’s drawn to lonely types. 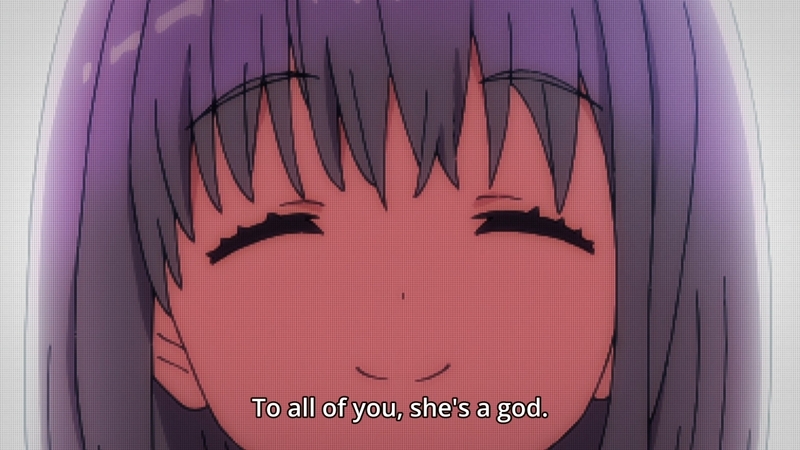 First Anti and now Akane. — Meanwhile, Yuta stops by the junk shop to look for her but has no luck. Again, they have phones. Again, he has called her in the past. Why not just try again? — But I guess he has no time for that, because he now has his own diminutive character to worry about. 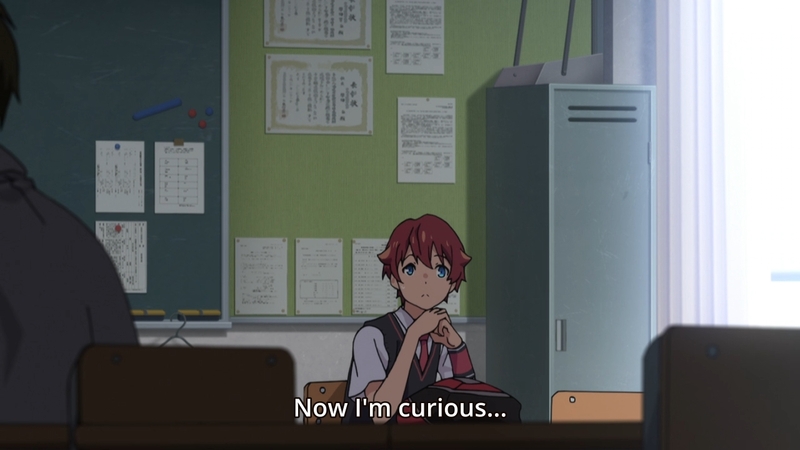 Outta nowhere, some new girl just approaches Yuta. 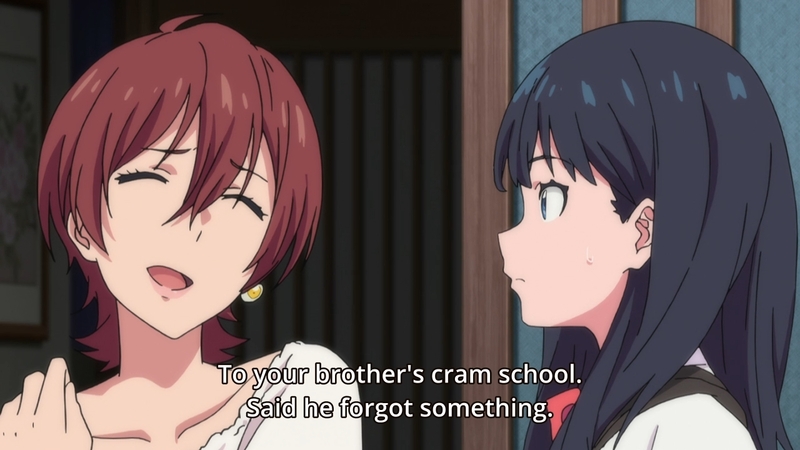 If Rikka gets a younger brother type to care for, then maybe Yuta gets his own lil sis. 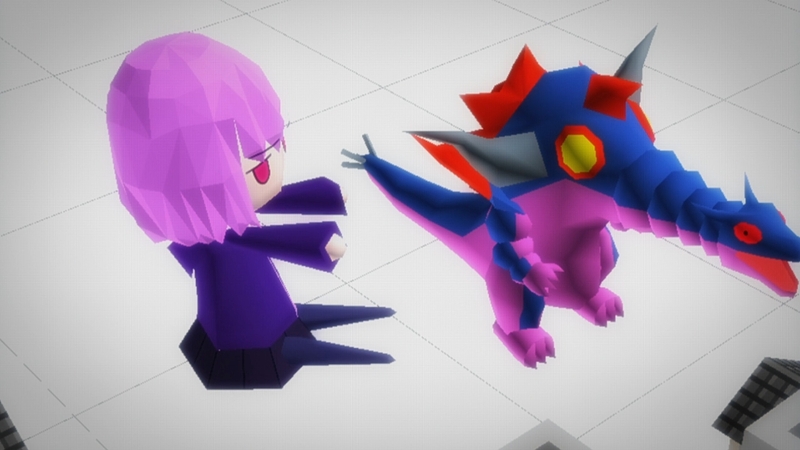 And like Anti, the new girl is also a kaiju… or so she claims. — Welp, she ain’t lyin’. Who’s the lil sis now? Also, what’s with all these hobo-looking kaiju running around? 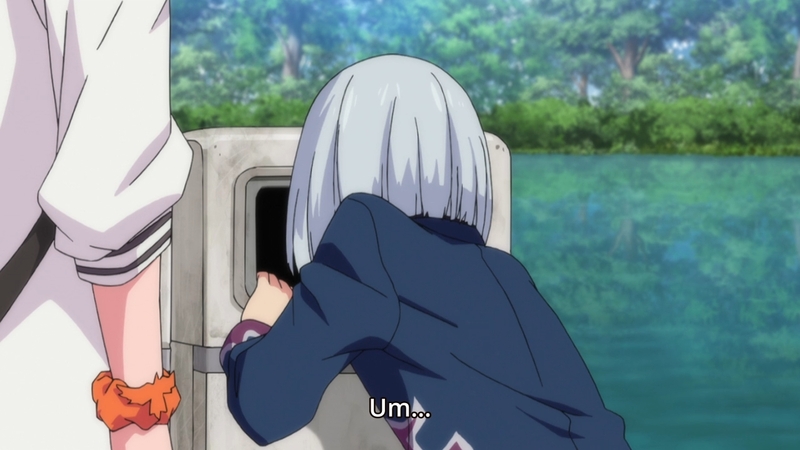 — Elsewhere, Rikka bumps into Anti digging for food out of a trash can. 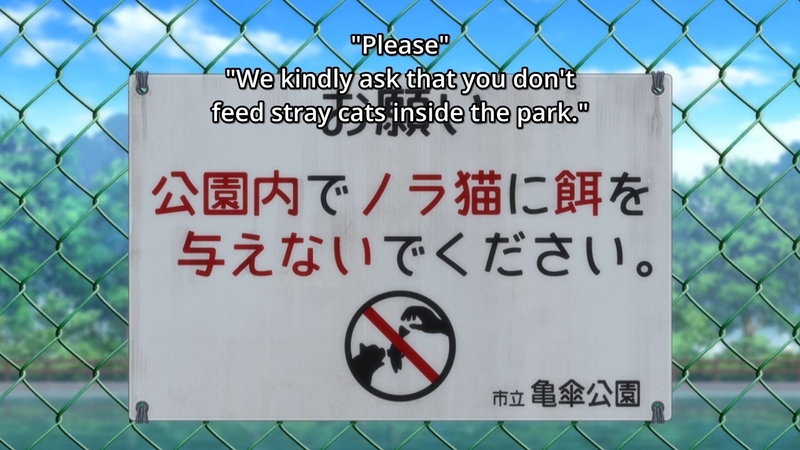 I know she feels bad for him, but she should really pay heed to all of the signs around the area. 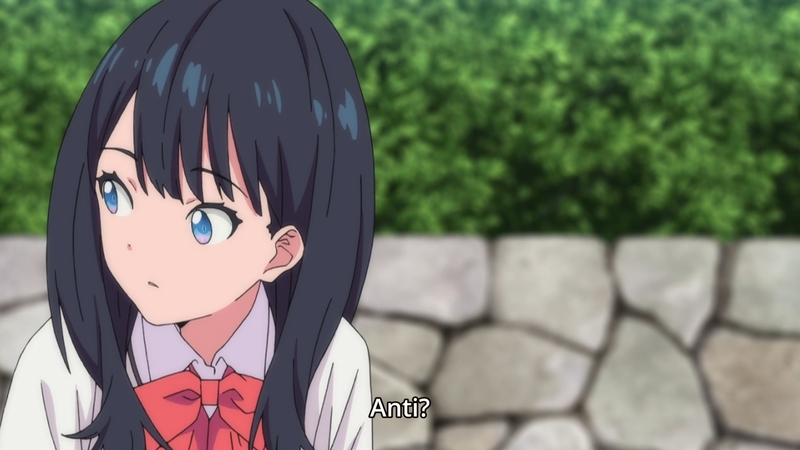 — How come Rikka doesn’t seem to be bothered that his name is Anti? His name is Anti. Who names their kid Anti? — Good ol’ Samurai Calibur is keeping an eye on things. — Oh, Rikka has a brother. Has this been mentioned before in previous episodes? I honestly can’t remember. 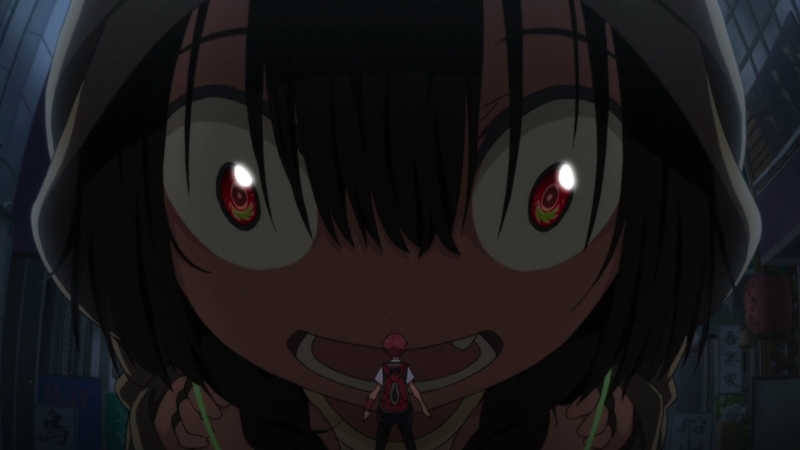 Still, this might explain a few things… like why she pities lost, wayward children like Anti so much. 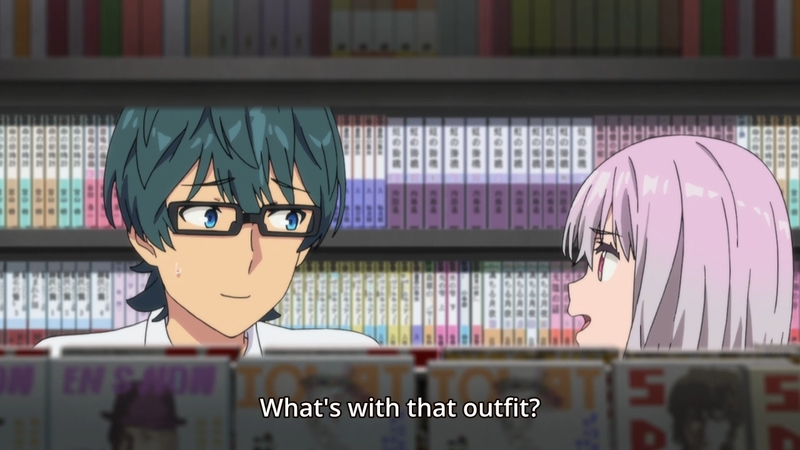 — Lurking just on the other side of the bookshelf is Borr. The Assist Weapons are all over the place, huh? If Yuta and company aren’t going to do any investigating, these guys still can. Plus, they gotta make sure that these kids are okay. Do they really have to, though? 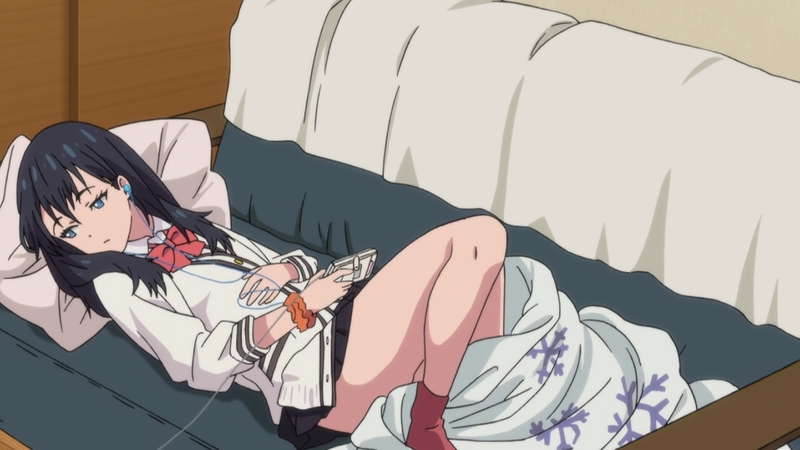 So far, neither Rikka nor Sho have really done anything all that important. I guess Yuta needs them for emotional and moral support, but… yeah… I hate to say it, but they don’t really do anything to help him. — Of course. 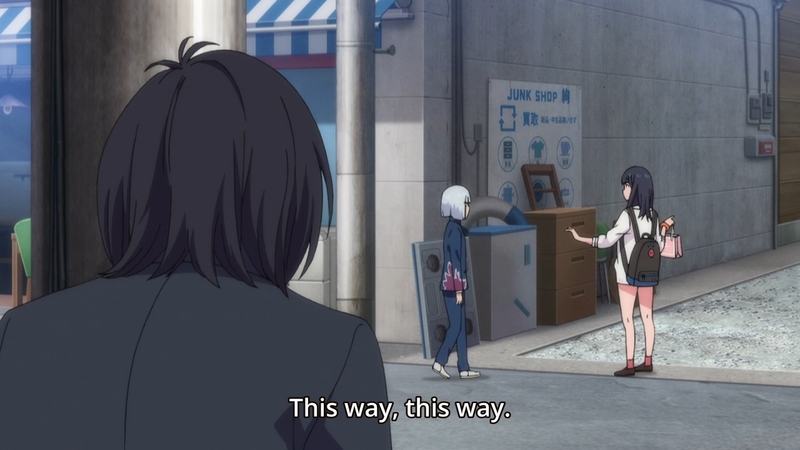 Just as Anti is about to tell Rikka that he’s looking for Yuta, she interrupts him so she doesn’t end up hearing anything. It might take a few more episodes until she realizes that he’s a foe. And since she’s treated him so nicely, maybe Anti will eventually spare Yuta’s life one of these days. Maybe. — Back to the other hobo kaiju, she and Yuta are now on their “date.” They all eat the same damn food, too. It’s like there’s nothing else to eat in this damn universe. (Note from the future: since Akane created this world, maybe she’s filled it with only the foods that she likes… like that dumb hot dog sandwich.) I think it’s a safe bet, however, that Yuta won’t be shampooing this little girl’s hair anytime soon. Just a hunch. — This girl’s the opposite of Anti. 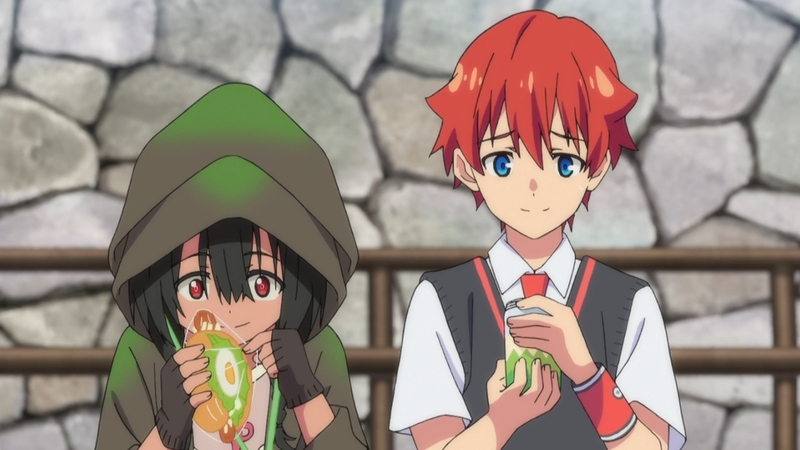 Not only does she have money (not a lot, but she still has some as opposed to nothing), she gives Yuta food instead of the other way around. She also wants to treat Yuta instead of killing him. Hell, maybe she’ll be the one to clean Yuta’s hair… just kidding. But what does she really want with him, though? — The girl tells Yuta that they should travel outside of the city, because there’s nothing there. Nothing where? Nothing outside the city, apparently. Does the rest of the world not exist? Have these children just been blissfully unaware of that? — Uh… huh… that explains the fog. That explains quite a bit, actually. — This is the worst not-product placement yet. C’mon, you’re a god. 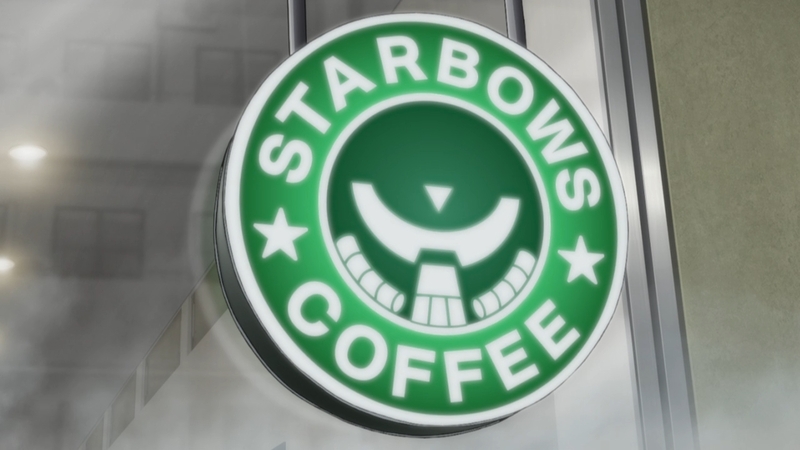 Starbucks isn’t going to sue a god! — Now the story is being all meta, because we now hear Akane telling Sho that “they” shouldn’t be making episodes without kaiju in them. Technically, Anti and Yuta’s new friend are both kaiju, but neither of them have transformed into their kaiju forms. — Back to Yuta and his kaiju friend, the girl explains to him that all the monsters are coming from the heart of one lonely human: Akane. He doesn’t know any of this until now, but it’s not news to us. We’ve known this since the second episode. Luckily, this isn’t the only bombshell she has in store for us. 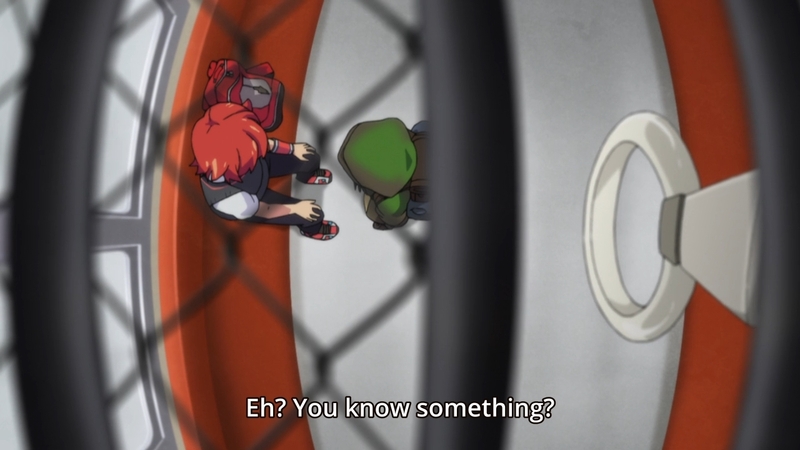 — Meanwhile, Akane keeps trying to ask Yuta’s friends all these roundabout questions. I don’t think she’s helping her cause. — On the train, the little girl continues to explain everything. 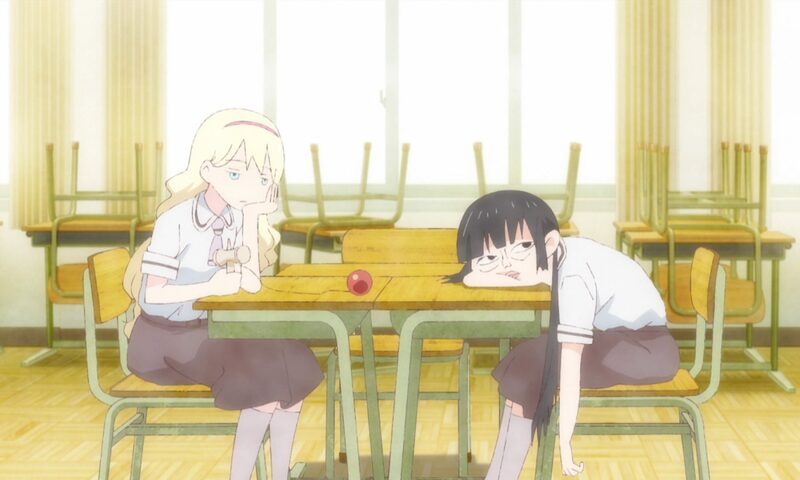 What is Akane doing? 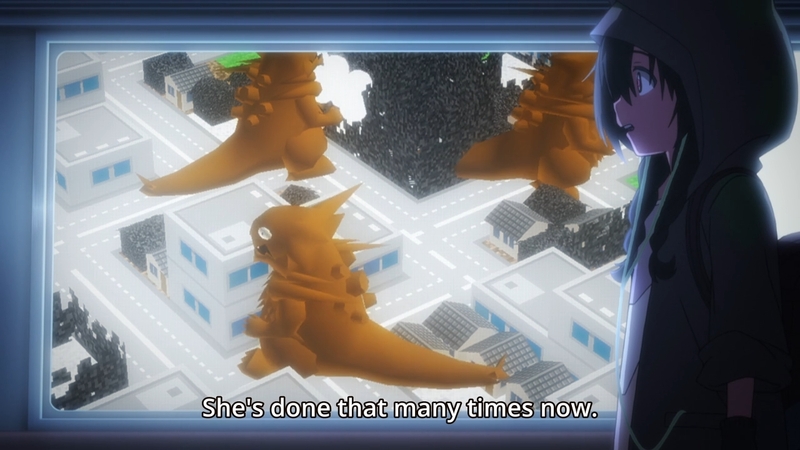 She’s creating kaiju in order to correct this world. 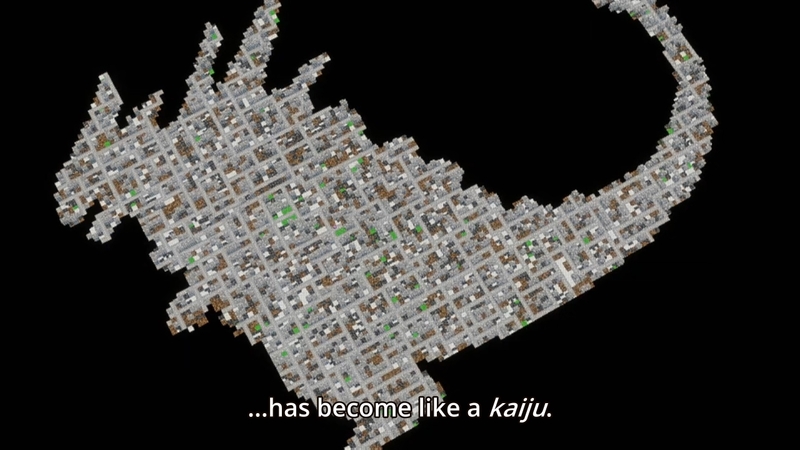 This apparently kaiju-shaped world that she created somehow with her own bare hands (okay, maybe not her bare hands…). This world that only seemingly consists of the city and its inhabitants. This world that she doesn’t even like! Remember, she hates going outside! — Does Akane know that she’s responsible for this world, though? — And because Akane is so unhappy, this leaves her heart vulnerable to manipulation — manipulation from an outside source. — If Alexis is not originally from this world, I guess you could consider him an alien! 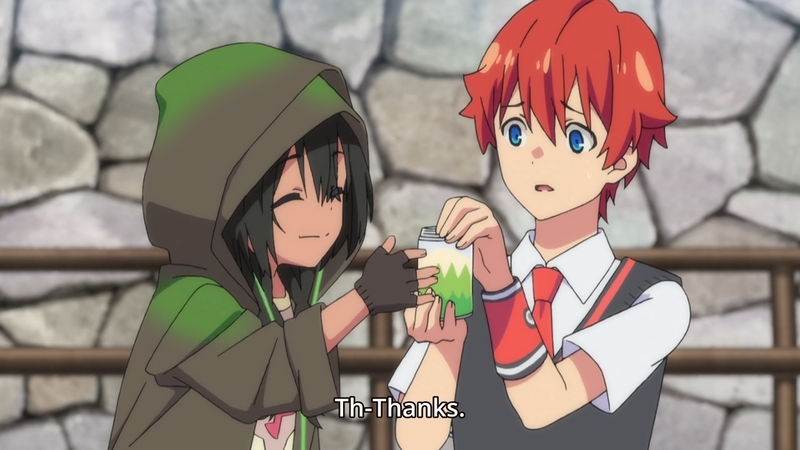 Ah yes, another one of Trigger’s trademark aliens! — Back at the cafe, Sho ultimately refuses to tell Akane the truth about Yuta. In his mind, he thinks he’s protecting her. 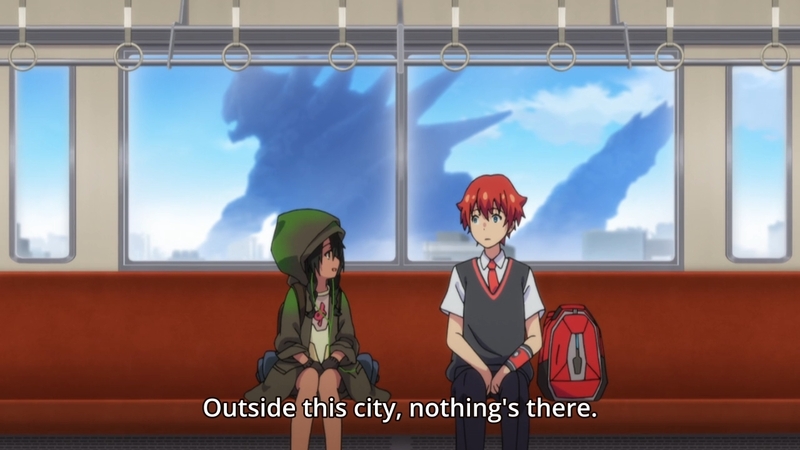 — Anyways, the kaiju girl tells Yuta that despite her appearances, she’s actually older than this city. As such, she’s not one of Akane’s creations. 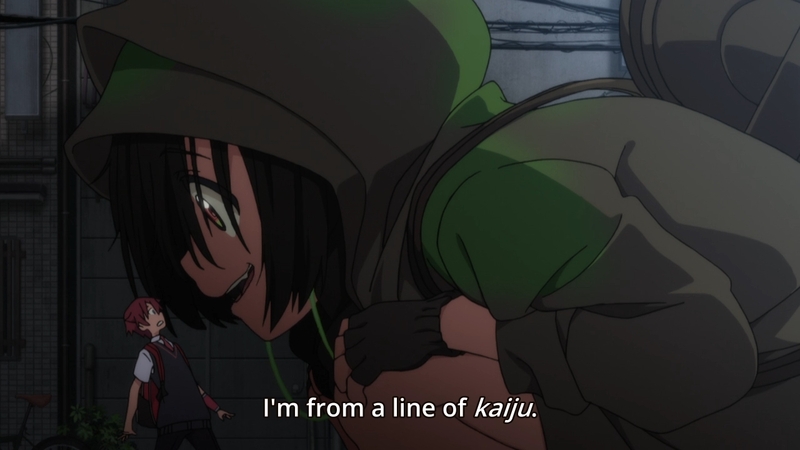 I guess she’s one of anime’s patented “lolis with an old soul” characters. — After hearing everything — and not really questioning the veracity of what he’s been told — Yuta declares that he knows what he must do. Yeah, is that so? 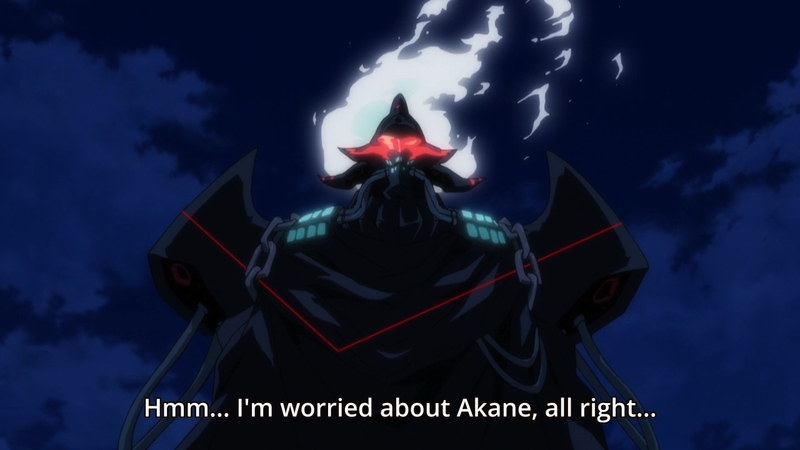 I bet he’ll try to heal Akane’s heart or something. I mean, that would be such an anime protagonist thing. — The train eventually loops back to the city, and that’s where the kaiju girl says her goodbye. She then claims that her predecessor owes a lot to Yuta. Specifically Yuta? Hell if I know what that means. — By the way, ever since Rikka scrubbed Anti clean of his stink, he’s been looking for Yuta. 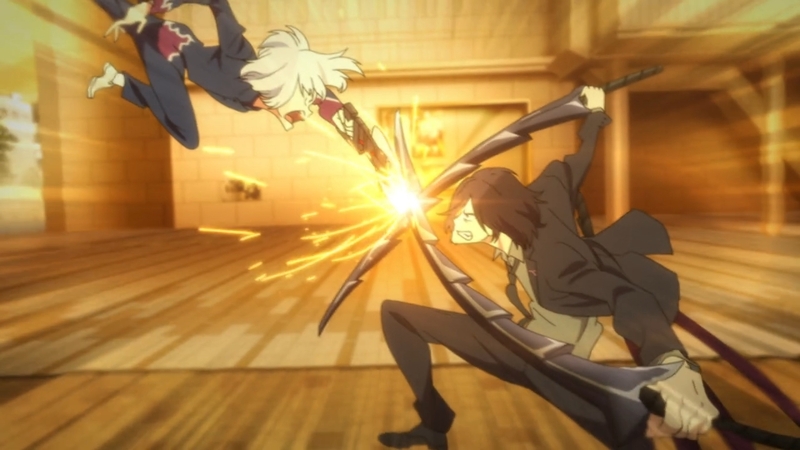 Well, he finally finds out hero and immediately attacks. Luckily, both Max and Calibur are there to protect the kid. 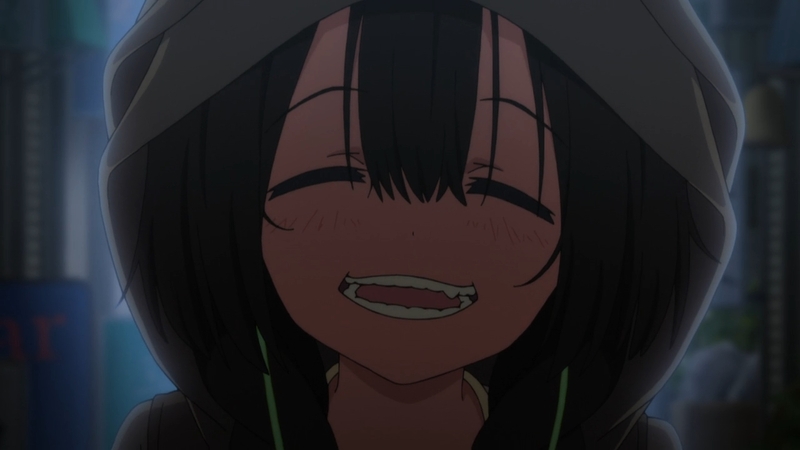 They also persuade Anti to back off, because Yuta and Gridman are not one and the same. Again, I had assumed that Anti is one of Akane’s creations, but maybe not. 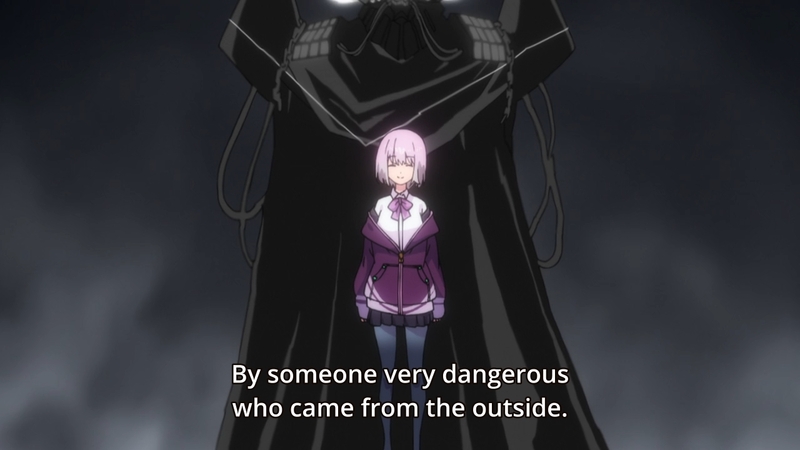 He has a serious grudge against Gridman that seems to have existed from even before this series. Maybe he came to this world just to chase after his mortal enemy. — Yuta finally returns to the junk shop and sees all of his friends. Even if this world is just a silly dalliance born from the mind of bored teenage god, it’s still filled with people with real feelings. So in the end, I guess Yuta will have to do all he can to protect the world that he cherishes. 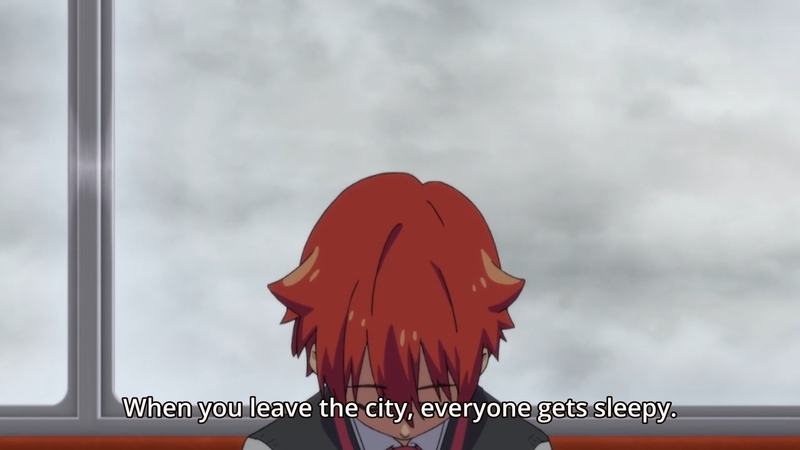 But it would be kinda sad if once this is all said and done, there’s nothing outside of this city for these kids to explore. So honestly, I don’t know how I truly feel about this week’s major revelations… assuming that everything we’ve been told is true. Well, who knows? Maybe if Yuta can get through to Akane, she’ll create the rest of the world for them to play with. — Later that night, Anti shows up back at Akane’s home to deliver the bad news. Like before, she just throws her phone at his face. 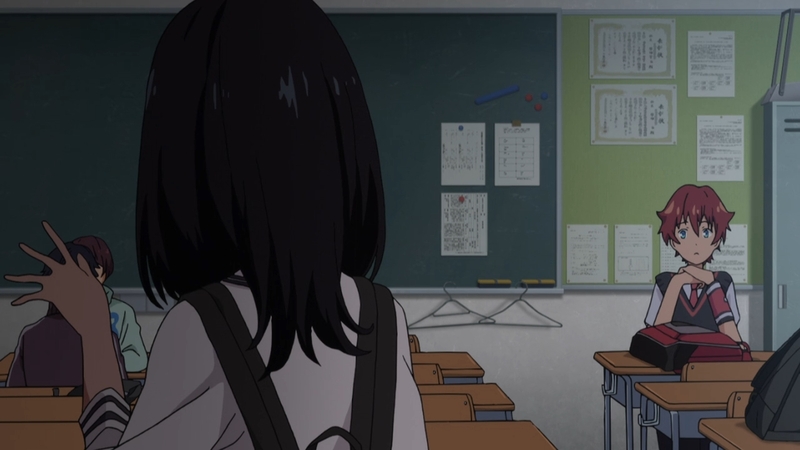 — We then see Alexis watching Akane ominously from the rooftop. Maybe it’s time for him to finally play a bigger role.